Baby calamondins reaching for the light. If you've already put in a good set of trees, why not start filling in the edges with your own seedlings? Sure... it takes "forever." But the satisfaction of growing trees from seed is unbeatable. 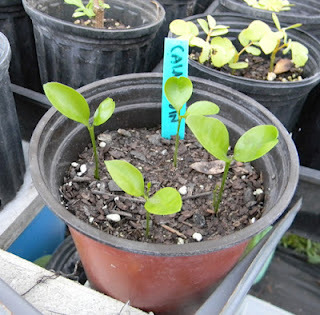 I have 4' key lime trees out back that my daughter and I started from seed. I just put them in a corner of my garden area and water as needed. And they grow... grow... grow. This spring we started pecans from seed and planted a few out in the yard. We've done the same with loquats, pomegranates, peaches, various nitrogen-fixing trees, papaya, a plethora of citrus and even avocado and mangoes (which we keep in large pots to overwinter in the greenhouse.) Right now I'm attempting to germinate some American persimmon seeds. They're sitting in a little flat of potting soil, exposed to the elements. This should give them the winter chill they need over upcoming months and send them through the earth sometime in the spring. If they fail... I'm out a few minutes planting time and the moments spent gathering overripe persimmons from the ground and squishing the seeds out. If they succeed, future generations can share in my success. The cost of starting trees from seed is almost zero. And if you're always planting the seeds from the fruit and nuts that come through your kitchen, the gradual result is that over time you have lots and lots of young trees you can plant out and share with others. Plugging a few into vacant lots around your neighborhood isn't a bad idea either. What's the loss? 2 minutes of planting time? Try starting a few. It's addicting. what a coincidence, i'm going to try starting american persimmon seeds this winter as well. i've noticed they don't seem to be available at the nurseries. i guess they need 3 months of cold, so some will be outside and some in the referigerator. did you scrub the fruit off your seeds? Cool - let me know how it works out. I have no idea why they aren't sold... the trees are wonderful. I scrubbed some of them and others I didn't. I had plenty to start with, so I figured I'd go both ways and see what happens.